A rough analytical expression for the Milky Way's radial mass distribution? I found the image below in Space.com's article This 3D Color Map of 1.7 Billion Stars in the Milky Way Is the Best Ever Made, although it is not the map mentioned in the title. If you imagine a band along the galactic equator the dominant velocity shows two positive and two negative "peaks", with a zero crossing in the direction of the galactic center. Purely for fun I wanted to see if I could reproduce this behavior with a simple calculation based on a 2D calculation assuming circular motion and a radial density distribution $\rho(r)$ which I could then use to figure out a rotational velocity distribution $v(r)$, bun I swiftly realized that I have no idea what the density profile would look like. For the purposes of this simple exercise, what would be an analytical expression that roughly matches the Milky Way's radial density profile, projected on to its equatorial plane? For spherically symmetric distributions, Newton's Shell theorem allows one to treat all mass inside a sphere defined by an orbit's radius as if it were at the center, and to ignore all mass in the shell outside of that radius. Is there anything like an analog to this for a radial distribution within a plane? where $v$ is the rotational velocity. Note that you may see other formulations which use $\sigma_v$ rather than $v$. In this case they're using the velocity dispersion which is slightly different than the rotational velocity. Other, more realistic density profiles have been found by running simulations of the Universe and matching functional equations to the density profiles of the resulting galaxies. Such popular results are the NFW profile and the Einasto profile. where $\rho_0$ and $R_S$ and two, halo-dependent parameters. where $A$ and $\alpha$ are configurable parameters. The Shell theorem for gravity does not extend to a 2D ring. However, I will say that when talking about the orbits of stars in galaxies, the mass of stars outside a star's orbit are generally considered negligible. The primary reason for this is that it is Dark Matter which comprises most of the mass of a galaxy and contributes the most to defining a star's orbit in a galaxy. The Dark Matter halo is often assumed to be spherically symmetric, in which case Newton's Shell theorem does apply and the mass you're concerned with in determining a star's orbit, is the mass of the Dark Matter halo interior to the star's orbit. @Rob Jeffries mentioned that "You get the density distribution by looking at the velocity data." I also believe this is what you are looking for, so I will give some calculation details. Since observationally we can construct the rotation curve which is $v = f(R)$, the density profile is then a function depending only on $R$: $\rho = g(R)$, i.e., the radial mass distribution. Some notes include i) the mass $M$ includes dark matter; ii) $v$ is the tangential velocity, not the radial velocity as presented in the figure you mentioned. Not the answer you're looking for? Browse other questions tagged galaxy milky-way velocity mathematics or ask your own question. Why does the neutral hydrogen velocity have this characteristic behavior in the galactic plane? 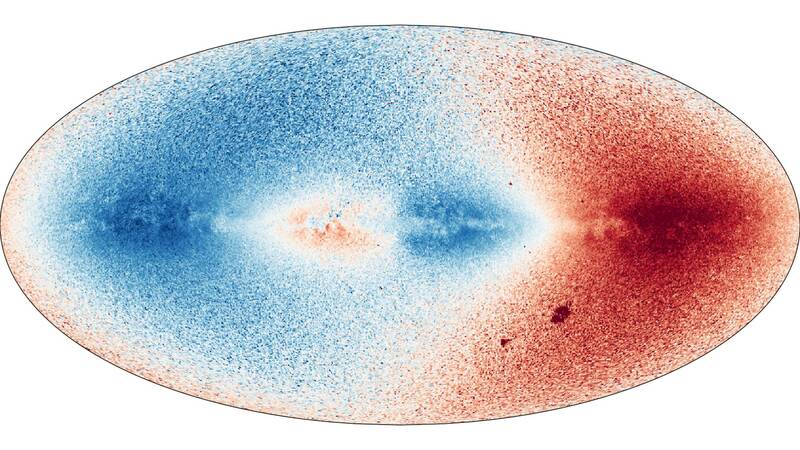 How is interstellar gas density mapped from GAIA data?